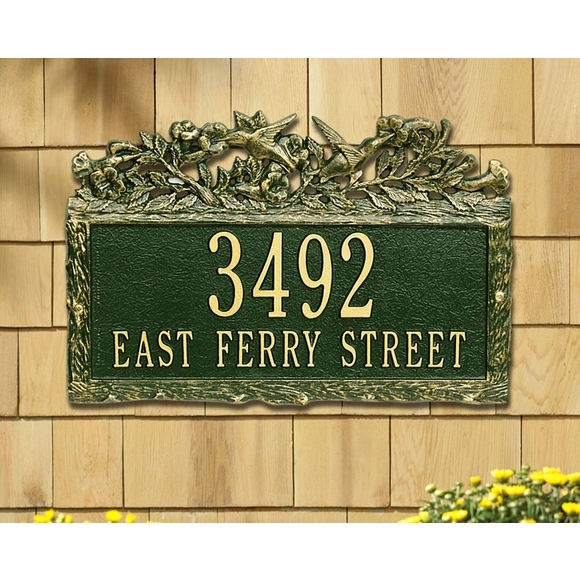 Personalized Address Plaque with Hummingbirds - - one line or two line 15.5" x 10" rectangle sign. Woodland border on all four sides. Two busy hummingbirds, flowers, and leafy branches complete the woodland theme. Wall mount. Made in USA. The two-line version holds up to five 3" characters on line 1 and up to seventeen (17) 1.25" characters on line 2. Personalized Woodland Hummingbird address plaque.